My thanks to Bioscope regular David Pierce for bringing to my attention a section from the Library of Congress’ Prints & Photographs Online Catalog, which includes a section on World War One posters, which in turn has a number of striking posters on official American films (and French, Italian and German) from the First World War. 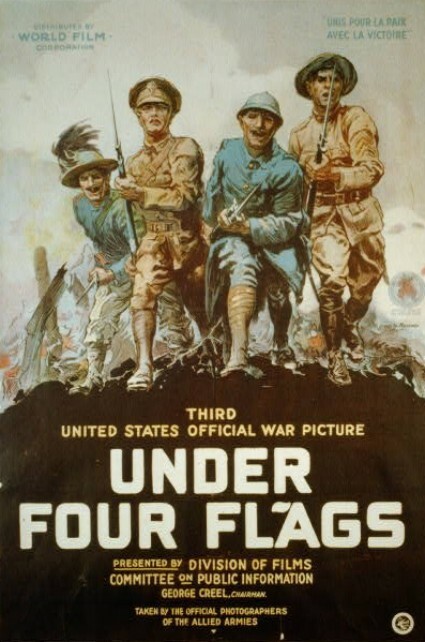 The above dynamic poster advertises Under Four Flags, the third of the documentary features produced by the Committee on Public Information. the four flags refer to the USA, France, Britain, and Italy. To find this and others like it, just search under ‘film’, ‘cinema’ or ‘motion pictures’. To find out more about the Committee on Public Information and its head, George Creel, see this Bioscope post on his famous book How We Advertised America. And to investigate what generally there is on the LoC’s Prints & Photographs Catalog, you can find the main page here, or take a short cut and click on motion pictures here (not all of it silents, or course).